Bedrock Strength is a 12-week strength training program which includes a User Manual that walks you through every detail of the program, including how to tailor ANY exercise to you and the Exercise Glossary, containing clear, vivid photographs and detailed exercise descriptions. 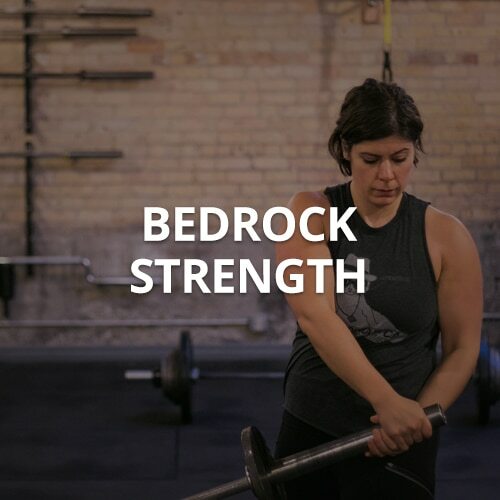 Suitable for total beginners who have never lifted a weight before, or experienced lifters looking to shore up a shaky foundation, Bedrock Strength is a rock-solid strength program that will increase your strength, improve your mobility, and make your bod feel great. We were built to move. Most of us aren’t doing that, and it’s to our detriment. I can relate: I was once one of those people searching for just the right exercise routine. Many years ago, I left a sales job where I was on my feet eight hours a day in three-inch heels—with the hip and low back pain to prove it—to stay home and raise my two young toddlers. I used my personal experience of what I needed and combined it with the knowledge I've gained training other people for a decade and created Bedrock Strength, the training program that will finally get you stronger. Bedrock Strength is exactly the program I wish I’d had when I first started lifting weights. The 12-Week Bedrock Strength Training Program, written by me, JVB, and co-coach Jen Sinkler. The Bedrock Strength User Manual, a comprehensive ebook that walks you through every detail of the program, including how to tailor ANY exercise to you. The Bedrock Strength Exercise Glossary, containing clear, vivid photographs and detailed exercise descriptions. Everything in Bedrock Strength can be learned by anyone interested in getting stronger, regardless of their level of fitness experience. Is this program REALLY different from other strength programs? Without a doubt! Talking about the difference between Bedrock Strength and other strength programs is like building your own salad at the salad bar versus purchasing a pre-made salad in the grab-and-go section of the grocery store. In the latter, there might be bits and pieces you really like while the remainder goes into the trash. In the former, you have to opportunity to enjoy every single bite because you made it exactly how you wanted it. Of course it also has what you’d expect a good training program to have: a complete training manual and instructions for how to complete the program successfully, plus detailed descriptions of every single exercise included. Can I do the workouts at home or, do I need a gym membership for Bedrock Strength? Here’s the deal: We would prefer you have access to a full gym for Bedrock Strength, because to truly build max strength, it’s nice to have access to barbells. Bedrock also calls out the need for access to a wide variety of free weights: dumbbells, kettlebells, and suspension trainers to name a few, and while exercise substitutions can be made, having access to a full gym of equipment will make your trek through the program much easier. I’m in! How will Bedrock Strength be shipped to me?? Listen, 1998 called and it wants its shipping methods back. Bedrock Strength is a completely digital, downloadable set of PDFs that you get instant access to as soon as you purchase. What’s more, you can download and access the entire system on any device that can read a PDF—which these days is nearly anything. You can read it on your computer, your tablet, or your phone. You can even print it out and organize it into a three-ring binder, if you prefer.